We consider the problem of recognizing whether a given binary string of length n is equal (up to rotation) to the input of an anonymous oriented ring of n processors. Previous algorithms for this problem have been ``global'' and do not take into account ``local'' patterns occurring in the string. In this paper we give new upper and lower bounds on the bit complexity of string recognition. For periodic strings, near optimal bounds are given which depend on the period of the string. For Kolmogorov random strings an optimal algorithm is given. 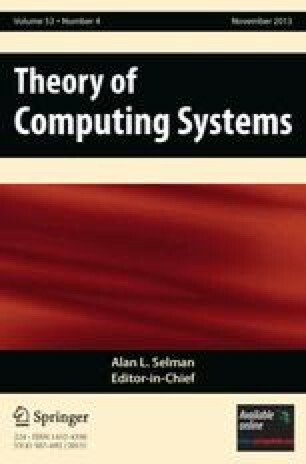 As a consequence, we show that almost all strings can be recognized by communicating Θ (n log n) bits. It is interesting to note that Kolmogorov complexity theory is used in the proof of our upper bound, rather than its traditional application to the proof of lower bounds. Received October 15, 1996, and in revised form June 12, 2000. Online publication October 13, 2000.